I am assuming AF’ers are more attached to the exam. your expected score in the morning out of 60 and evening for 60I just want to do a quick survey so that we can what the average cuttoff would be. I am assuming if top 1% is close to 90. Then there is no way, they could make 70 as cutoff. I know we are not on the MPS system. This is probably optimistic though. I wish I was better at remembering questions so I could check more of them. Most of them when i think about it now it is just a blur…. I definately thought the exam felt similar to practice exams which is reassuring. There were 90 questions I knew flat out. Assuming horrible guessing rate I could get 95. Practice test and mocks ranged from 70% on CFA Sample 1 (crap shoot) to 55/60 on Mock 1 AM. No real basis to this but 36/60 AM and 48/60 PM (60% and 80% for an even 70%). Time management issues in the AM; back to normal in the PM. Feeling +70% in most sections and 50-70 in one or two. Not feeling any sub-50s but possible in a topic with only 5% testing (6 questions). AM felt like the CFA mock, PM felt like a Schweser mock. > issues in the AM; back to normal in the PM. > topic with only 5% testing (6 questions). I think you summed it up perfectly. I did all 4k questions in the Q-Bank and blew through PM because of that. 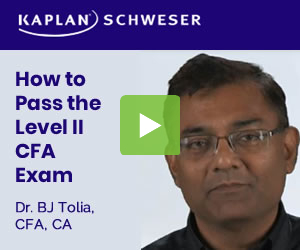 It didn’t feel like a CFA exam it felt like a Schweser exam which is vocab based imo. Do you agree to the pass score of 63% and passing rate of 49%? pass score of 63-65% and 49% pass rate. Like so many others, I found myself pressed for time on the AM section. Very scary stuff. PM was much more reasonable, but I still wish I had known some sections better. Including ONLY the answers I was sure of, I think knew 34 of the AM section, and definitely knew maybe 37 of the PM. Hoping that I did no worse than guessing on the remaining problems [even though some I was pretty sure, I didn’t count them unless I was positive]. I’m totally terrified either way. To spend 5 months of my life working harder than I’ve ever worked at anything and walk out feeling “so-so” is gut-wrenching. That said, I felt like I crushed ethics, which hopefully helps if I’m on the fence. I don’t think passing score goes into the low 70’s. They would need to have a new grading scale if that were the case. If we see 50-75% for the middle range then we know there is a problem. Man I thought the AM was tough. FRA was my killer. I should have let go and moved on to the stuff I know best, but I was stubborn when I really shouldn’t have been. I was rushed and almost ran out of time because of that. I think I’ll get a 36/60 on AM and 44/60 on PM. I think I’ll average short of 70. I wish I could have started preparing before Feb 1st. 400 questions only in Qbank aren’t enough to get you to blow through an exam quickly. I would imagine the MPS would be ~70% or a little higher, and I don’t expect the pass rate to be much higher than last year, which was 41%. it will be more than 41% I will post a guarantee on that. Only flat out guessed on 1 in the AM, and 3 in the PM. In the AM, I had about 10 that I wasn’t 100% sure on, but thought I knew. PM was about 15. The rest I felt pretty sure about. PM: 33+7 = 40 –>84 / 120. I’d be surprised if the pass mark was higher than 80. 70/120, Band 8 or 9. OK do I have a problem if I have run a sensitivity and scenario analysis on this? Or is it only a problem if I run a Monte Carlo Simulation? I’m thinking right around the 74% range. My pessimistic is probably a little low and my optimistic is a little high. I remember someone posting in Level II that last year they walked out feeling very confident. Not only did they fail but to add insult to injury it was band 7. And I’ve talked to some people who have no clue how they ended up passing. Personally I think I failed, but if my guesses were good then there might be a chance. I think a lot of people will be surprised in August. With only 120 questions the difference between getting band 7 and band 10 could only be a few questions so don’t give up if you see a band 6 or something come results day! I guess keeping aside the score we should hope on random probability selection. but if 40%+ guys around the world are nailing 70%+ then CFA has really become competitive and I probably failed, although a tail risk :P.